Jon Alper's probably insufficiently humble opinion » Filter Forge Rocks! Home > Inspiration, Tools	> Filter Forge Rocks! I can’t say enough nice things about this tool really and my only complaint is that it could be faster. If you do more than the most basic fiddling with graphics, if fiddling with graphics is just fun for you, go buy this tool! BONUS: There’s a 70% off sale running now too: http://www.filterforge.com/buy/ so the entry-level version starts at $44. I bought, and I’m glad I did, the full ‘Pro’ version and the DVD with the snapshot of their full huge filter library but there’s big fun to be had even at the entry level. 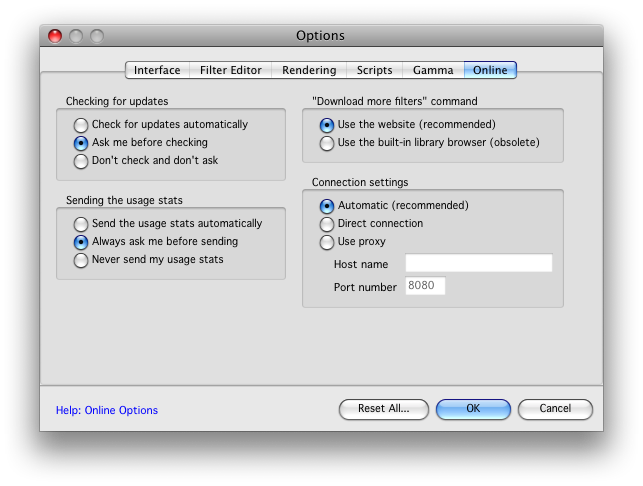 While in the wrong place for a Mac (Tools->Options rather than <Application Menu> -> Preferences) this is one of the clearest, most polite and most flexible settings panes for the online behavior of any application. Kudos!